The city by lunch joints: a typography. In those areas with large Parisian-style avenues, uniform rows of five storey buildings (colonial Deco predominating) and an aproximately grid-like layout, there you will find only “snack” places and – occasionally – restaurants with linen and several forks. “Snack” means chawarma, pizzas, brochettes of grilled meat, sometimes a rotisserie chicken – not inexpensive and only occasionally very good – dished out in your standard international fast-food layout. Then abruptly the crowded rectilinear streets of the French-built metropolis fizzle into winding alleys. The old medina, kernel around which modern Casablanca was built, or the newer neighborhoods piled up around the edges of the colonial city: landscapes of a different logic and different texture, odd-angled cubes of adobe. The honking of horns fades out, and time distends in proportion to the narrowing of the streets. In these outposts of that other Morocco, the Morocco of villages and small towns, are the chaabi restaurants. Dark and undecorated, with a few simple tables at the entrance and a wall of great blackened vats at the back, the chaabi restaurants cook up what the vast majority of Moroccans actually eat: home food, cheap and filling. If one didn’t stray out of the French part of the city one would wonder where all those gorgeous vegetables wheeling by on ambulant carts are going: there is no sign of them in the “snack” places. But find a chaabi restaurant and you know: stews of pumpkin and potatoes heaped onto chipped plates, dishes of chickpeas sweet with allspice, small bits of lamb so soft you eat them with a spoon. Fridays, couscous. Also particular to the non-rectilinear part of the city are other lunch modalities: the soup and fried-things joint with its tell-tale cauldron of harira out front to lure passersby, the greasy-bread stand with its sticky lumps of dough waiting to be stretched out on the griddle. These principally cluster around market areas, bus stops, at the entrance to the neighborhood. No sign of “snacks,” yet. But the geography of the “snack” expands: one by one, the little pockets of village within the city as well as the great swaths of self-built adobe suburbs – bastion of the chaabi restaurant, indeed the chaab (the people, the working class) itself – are being razed in favor of new rectilinear developments with their french fries and rotisserie chickens. There is little or no contact between worlds in a country where incomes vary by orders of magnitude: the Morocco that goes to restaurants with tableclothes and forks will occasionally have a “snack” on the run but would not ever, ever set foot in a chaabi restaurant. Does not, in fact, register the existence of the chaabi restaurants, so far are they from the prosperous class’s experience of the city. Many in Casablanca have lived their whole lives in the rectilinear avenues of the center, never having wondered what might lie beyond the walls of the medina or in the outlying market districts. 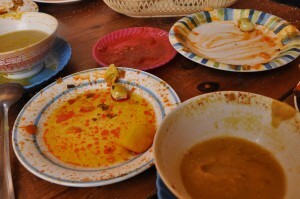 Likewise the Morocco of the chaabi restaurants might very occasionally have a “snack” but cannot concieve of a restaurant in which a salad (served on a tablecloth, with fork and knife) costs ten times what a full meal for two would if served out of the great vats of the chaabi restaurant. One laments the neighborhoods plowed under, and wonders about their inhabitants: where will they go? But it is easy to be nostalgic on others’ behalf. “Snack” joints as the democratic middle ground, the promise of spreading prosperity, the conquest of consumerism for all? Maybe. The investigation continues.